Have You Considered Enhancing Your Venue's Restrooms? Are you looking for new ways to entertain fans at your venue? 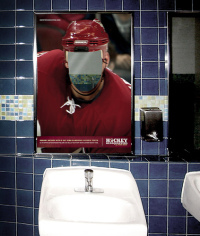 Have you considered enhancing the bathroom experience for your fanbase? A horse racing venue in Mexico created a unique way to entertain consumers attending and betting on races at the track. Track representatives branded each of the bathroom stalls with a different horse color/number (portraying that consumers would be racing against one another when going to the bathroom). NBA/NFL/NHL - These organizations can create numbered stalls representing players on the home/visiting team. Believe it or not, there are Boston Celtics fans out there who would like to say that they went to the bathroom in Kevin Garnett's stall during halftime. MLB - Offer a "Match the toilet with the Inning" promotion, where fans have a chance to be rewarded for their bathroom experiences. Teams can brand nine toilets (#1-9) and feature a receipt machine near each toilet. During each inning the machine will give a redemption receipt to fans who use that toilet. If the home team scores the most runs during the 1st inning, fans who use toilet #1 can redeem their "redemption receipt" the next game for a discount on beer/non-alcoholic beverage at a select concessions stand.